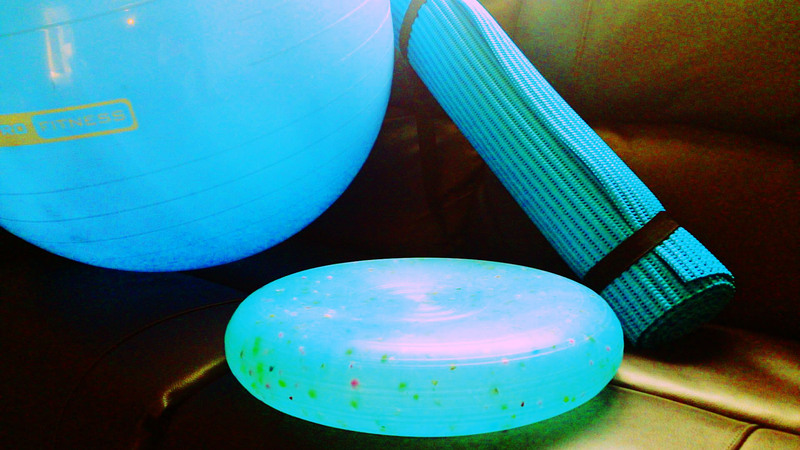 That’s an exercise ball on the left, a yoga mat on the right and in the centre: a dyno-cushion or as I like to call it: my pancake. I also now keep a ball and a pancake at the office as well. So now I do a set regime of pilates exercises and stretches, everyday, to help re-mobilise and re-strengthen my back plus make the front of my body do more of the work. (My lower back was supporting my whole upper body and front, which is a bad thing.) I also use the ball and cushion during the day in my rest breaks. In order to stop me from being on my computer all the time, I’ve installed Workrave, a free program for Windows and Linux users. You can customise it to tell you when you should have micro breaks (just step away from your PC for a moment) and rest breaks (get up, move around, make a cup of tea/coffee, etc). Alternatives for Mac includes Time Out (also has Windows version) and Rest. Currently, I am looking for something I could run on my Android phone to tell me to have breaks when gaming. Any suggestions would be most welcome, as using my phone’s timer is too fiddly. * I would like to point out that I was aware of my rights at my day job, but didn’t realise how few breaks I use to take away from my computer. EDIT: Julian Benson has also pointed out another risk of not getting away from your machine on a frequent basis: you increase your risk of deep vein thrombosis, as sadly documented in this PCGamesN article by Paul Dean. ← Am I really playing fewer games? I’d say I probably have the same problems. Thanks for a great post! You’re welcome :) Still trying to find something to help when I’m gaming.